JKSSB Naib Tehsildar Recruitment Exam Result 2018: 01/2015 Notification released through www.jkssb.nic.in advertised for 134 posts o Naib Tehsildar posts in Jammu & Kashmir. However, exam date & admit card is declared only in April 2018. Through latest notification it was announced that the JKSSB Naib Tehsildar Recruitment test (OMR Based Written Exam) will be held on 29th April 2018. Candidates after appearing in the J&K Naib Tehsildar posts should wait for their result to go for the next step. After the OMR Test we can also discuss here category wise JKSSB Naib Tehsildar Cut Off Marks & Expected Cut off points district wise. So, graduates with Urdu language knowledge should start preparing for the exam right now who have applied in 2015. JKSSB Naib Tehsildar Previous Question Paper. Jammu & Kashmir Services Selection Board (JKSSB) on their portal ssbjk.in recently released the hall tickets of individual candidates. Based on the hall tickets, candidates should appear in the exam. Merit list will be prepared for those crossing the category wise (general, sc, st) cut off points for the Naib Tehsildar post. Admit Card Download Link Click here. Result publishing date Not announced. Download notice regarding Naib Tehsildar Exam Date & Admit Card 2018. 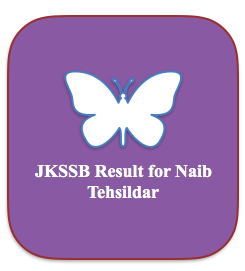 Are you in search of Jammu & Kashmir Naib Tehsildar Exam Result 2018 ? We would therefore like to tell you that the recruitment notification came out on 2015 for 134 posts through 01/2015 (item number 007). The board is conducting the OMR based written test after 3 years. So, it is not yet clear when the written test result will be declared. However, in the case of Lab Assistant and other exams, the board announced result within a couple of months. Therefore, we may expect the Jammu & Kashmir Services Selection Board or JKSSB will soon prepare the merit list & release the shortlist on JKSSB online portal. General English – 20 Marks. GK or general studies – 30 Marks. Constitution of India – 20 Marks. Constitution of J&K – 10 Marks. General Knowledge of J&K – 25 Marks. Furthermore visit www.jobsandhan.com to get latest updates regarding Jammu & Kashmir Govt Jobs and exam updates.